Epiphany! The dictionary defines it as a sudden, intuitive perception of or insight into the reality or essential meaning of something, usually initiated by some simple, homely, or commonplace occurrence or experience. That’s definitely what we have today. The Magi came from a far land to worship the newborn king, the Baby Jesus. A star led them to Bethlehem and to the manger where Jesus lay. Every year we put up the crib before Christmas. Then we symbolically place the figure of the baby in the manger on Christmas Eve. Today we complete the picture with the arrival of the figures of the three kings. There’s one more week of the Christmas season which ends with the baptism of Jesus. Next Sunday we’ll take it all down. There’s a ton of symbolism in the way we celebrate the birth of Christ. We spend four weeks getting ready for Him to come. Then we have the glorious celebration of His birth on December 25. On the following Sunday we commemorate the Holy Family. “Son of God”. If they did, wouldn’t the temple have been the first place they looked? Where else did they look for three days? But I digress. Getting back to our Liturgical calendar, on January 1 we celebrate the Solemnity of Mary, the Holy Mother of God. Jesus is a baby again. Sometimes this is called the feast of the circumcision, because that’s how the day’s Gospel ends. But the emphasis here should be on Mary. “Mary kept all these things, reflecting on them in her heart”. Imagine how overwhelmed this young girl must have been. That brings us to today, the Epiphany; a sudden, intuitive perception of or insight into the reality or essential meaning of something, usually initiated by some simple, homely, or commonplace occurrence or experience. Seeing a tiny newborn lying in a feeding trough for animals, about as simple and homely an experience as anyone is likely to have, the Magi suddenly, intuitively perceive the reality of what they’re seeing; the Son of God. We know that the shepherds have seen the child but these men aren’t shepherds. They’re not even Jews! They’re powerful kings from a foreign land and they’ve been called by God, led by a star, to be witnesses to the birth of the Messiah. The Gospel ends with them departing for their own country to deliver the good news of what they’ve seen. Here’s the thing. Jesus wasn’t sent just for the Jews. Paul tells us in the second reading that “the Gentiles are coheirs, members of the same body, and copartners in the promise of Jesus Christ through the Gospel.” He may have been the Messiah that the Jewish people had been waiting for but He was our Messiah too. You and I can have an epiphany just like the Magi did. Jesus reveals Himself to us in many ways, usually in ways that we’ll miss if we’re not paying attention. Someone says or does something that touches your heart. You pick up a book and something in its pages seems to speak just to you. Maybe you see a small child or a homeless person and you feel the need to do something. The other day there was a dog on Telegraph Road. He must have been hurt because he was running back and forth from one side of the street to the other. There was a major traffic jam because everyone stopped not wanting to hurt it. I thought at the time that there was still goodness in the world. So many people were willing to be late for work rather than take a chance on hitting someone’s pet. Your epiphany may come in church. It may come at work. It may come while you’re driving your car. You never know. We have to be paying attention. Next Sunday we’ll take down the Christmas decorations and return to Ordinary Time. But even in the taking down there’s symbolism. The trees and the lights and the manger may be gone, but Jesus remains with us. We just have to look a little harder to see Him. Finding Him in the ordinary things of our daily lives is our Epiphany. This ends my homily but I was listening to Cardinal Dolan’s homily for Sunday and he made an interesting point. The Magi were looking for an adult king. Imagine how surprised they were to find an infant! You can listen to the Cardinal’s homily here. Today we celebrate the Epiphany, the day when the Magi arrived in Bethlehem to pay homage to the new born king. Surprisingly, we don’t know much about the Magi. Matthew’s is the only Gospel that mentions them. We don’t know exactly where they came from. Matthew only tells us they came “from the east”. The “east” is a pretty big place. We also don’t know that there were three of them. Over the centuries we’ve come to think there were three because they brought three gifts. But, it’s not unreasonable to think that more than one king brought Jesus gold, or frankincense or myrrh. If there were no duplicate gifts, the stores wouldn’t set up special “return lines” the day after Christmas. In fact, the Eastern tradition believes there were twelve magi. So what DO we know about these magi. We know that they followed a star to Bethlehem. The word “magi” is the root of the word “magic”. The magi were astrologers. They were experts on stars and it’s no surprise that they followed one to Bethlehem. A Greek manuscript from around 500 AD names the three kings; Caspar, Melchior, and Balthazar. Like I said, we don’t know how many kings there really were, but three gifts brought by three kings is logical and the three names have been around for 1,600 years, so we’ll go with that. But, what’s the point of the kings, no matter how many there were? In the first reading, Isaiah prophesies that “Nations shall walk by your light, and kings by your shining brilliance.” The arrival of the kings, following the star, fulfills the prophecy. These kings, how ever many there were have come to pay homage to a baby; not just any baby, but a baby born in a cattle stall. You can imagine that those mighty, wise men wouldn’t make such a long trip, bring expensive gifts, and prostrate themselves to anyone less than the Son of God. 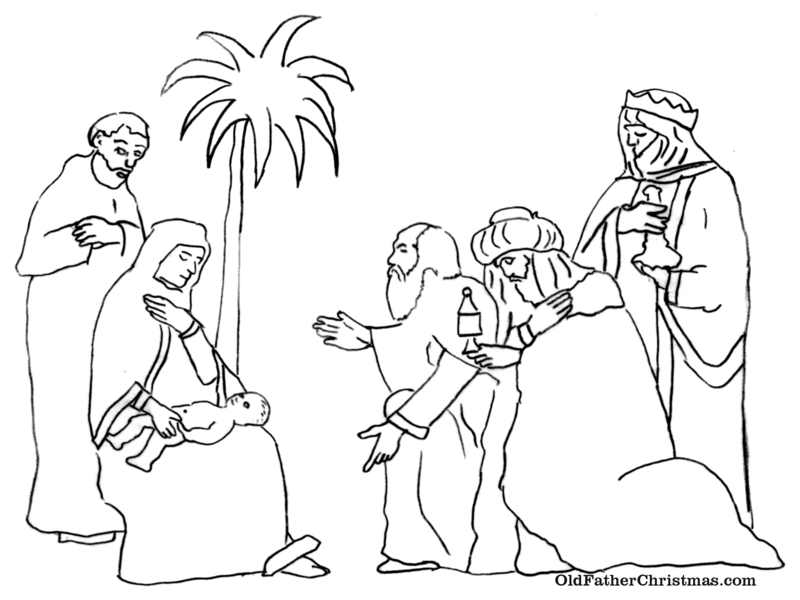 Herod tried to use the visitors to find the Baby Jesus. It makes you wonder, if the magi saw the star, why didn’t Herod? Obviously, God didn’t want Herod to see it. If he’d seen the star, he could have gone and found Jesus himself. Or, he could have followed the magi. But he didn’t. And the magi were warned in a dream not to go back to Herod. As Matthew says, “they departed for their country by another way.” You could say that once you’ve found Jesus, you can never go back the way you came. Your life, like the lives of the magi, is forever changed. OK, so why gold, frankincense, and myrrh? The gold is a symbol of kingship. For a king to give a gift of gold showed tremendous respect. Frankincense, or what we call simply incense today, is a symbol of deity; or Godliness. We use incense in the church today on special occasions. Myrrh was a perfume that was used in Jesus’ time for embalming. It was a symbol of suffering and death. Look at the words of the hymn “We Three Kings”. And, “Myrrh is mine; its bitter perfume Breathes a life of gathering gloom”. The final verse begins “Glorious now, behold Him arise, King and God and Sacrifice.” Gold, frankincense, and myrrh. If these mighty, foreign kings recognized who Jesus was, can we do any less? We’re at the end of two very special times of the year; Advent and Christmas. It’s time to take down the trees and the lights and get back to normal. But that doesn’t mean we shouldn’t keep the spirit of the season in our hearts for the next ten months until we do it again. Scholars tell us that Jesus probably wasn’t born in December. But does it really matter? For faithful Christians Jesus is born in us each and every day. For the last two months strangers have been greeting strangers with a smile. We’ve been exchanging greetings with one another. Why stop now? [There’s a reason why we exchange the sign of peace during mass.] At the hospital where I volunteer they have a five foot/ten foot rule. When someone is ten feet away you’re supposed to make eye contact. When they’re five feet away you’re supposed to smile and greet them. That’s a good rule for anybody, anywhere. Something like that could actually change the world. And changing the world is what we’re called to do. If mighty foreign kings could prostrate themselves before a baby in a manger (and think about what’s on the floor of a cattle stall) smiling at strangers is the least we can do. You’ve probably seen the “Catholics Come Home” TV commercials. With 70% of people who call themselves Catholic not coming to mass, the commercials are a great idea. But I think they’re making one mistake. Where’s the joy? Yes, we invented the college system. Yes, we’re the largest charitable organization in the world. Yes, we created the Bible. Those are all wonderful things but I’m not sure any of them would make me want to come back to church if I’d been away. Here’s the thing. It’s a PRIVELEGE to be Catholic. We have SEVEN SACRAMENTS. Most protestant churches have three. We receive the actual Body and Blood of Jesus in the Eucharist. If you want to join most protestant denominations, all you have to do is show up and say you want to join. If you want to be a Catholic, you have to go to school! It takes months! If we want people to come back to church, and believe me, it’s critical for this particular church that we get people to come back, we have to show them the joy. You and I have to show the world how happy we are to be Catholics. We should sing when we’re supposed to sing. We should pray when we’re supposed to pray. And we should walk out of here at the end of mass with a big smile on our faces, knowing that we’ve just received the greatest gift God could give a mere creature; the gift of Himself. There’s no way we can ever repay God for such a great gift. The magi tried. They traveled many miles. They gave Him the best they had. The best we can do is to worship Him and to do whatever we can to share His gift with others. That’s the message of the kings, no matter how many there were. There’s a tradition in the Church that we bless our homes on the Feast of the Epiphany. We do this by writing an inscription above the doors with blessed chalk. Before the final blessing today, Father will bless chalk that you can use at home. The chalk will be at the entrances of church along with the prayer that you can use. With everything that’s going on in the world today, we encourage you to take the time to bless your home and the people who live there. If you know someone who’s in that 70% of inactive Catholics, feel free to take an extra piece of chalk and prayer sheet for them. 3 a (1) : a usually sudden manifestation or perception of the essential nature or meaning of something (2) : an intuitive grasp of reality through something (as an event) usually simple and striking (3) : an illuminating discovery, realization, or disclosure b : a revealing scene or moment. The arrival of the Magi in Bethlehem certainly fits this definition. The Wise Men discovered the essential nature and meaning of the Baby’s birth as soon as they laid eyes on Him. It was an event both simple and striking. What could be simpler than a baby born in a cattle stall and what could be more striking than the human birth of the Son of God? As we celebrate the Feast of the Epiphany we hope to have our own Epiphany, our own perception of the meaning of the birth of the Lord. In some ways our human minds just aren’t big enough to take it all in. But if we have the gift of faith, then we know in our hearts, if not in our minds, what it all means. We know, but we’re constantly seeking to know more. Hopefully our lives are a series of many epiphanies ending with the biggest one of all when we stand before God and everything will everything will be crystal clear.